Saturday, April 27th, 11:00 am – 2:00 pm Rain Date! Bring protective clothing and your smoker if you want help learning to light it and keep it going. This is a chance for new beekeepers to get your hands in a hive, to ask experienced beekeepers questions about what you are seeing (or not seeing) and to gain some confidence working with bees. Mentors who will come to you are in short supply so please take advantage of this opportunity to get hands on help with the bees. This is also a great chance to get to know other beekeepers and for them to get to know you so when you have questions, you’ll have people you can call. 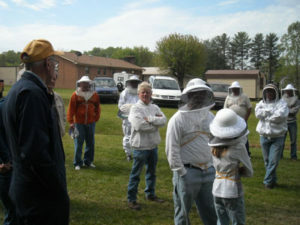 The testing for the NCSBA Master Beekeeper Certified Level will be given. You must be a member in good standing to take the test. Also, at this meeting, the Certificates of Completion will be presented to the Junior Beekeepers.